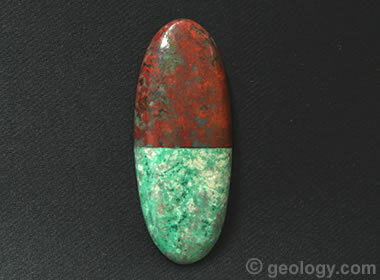 A rock of cuprite and chrysocolla that makes red sky over green landscape cabochons. Sonora Sunrise Pendant: A beautiful pendant cut from Sonora Sunrise with a sterling silver bail. The color pattern in the pendant is a good example of the “red sky over green landscape” that earned “Sonora Sunrise” its name. The cabochon is approximately 53 millimeters high and 20 millimeters wide. Sonora Sunrise is a trade name for an eye-catching red and green gem material. 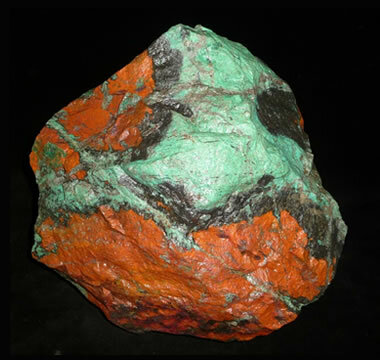 It occurs naturally as a rock composed mainly of bluish-green chrysocolla and bright red cuprite. That color combination can be cut into beautiful cabochons that suggest a green landscape under a brilliant red sky. The red sky and its Sonora, Mexico origin were combined to make the “Sonora Sunrise” name. Small amounts of black iron or iron oxide minerals are present in some specimens. These are usually concentrated at or near the boundary between the chrysocolla and cuprite - suggesting mountains or outcrops of dark rocks on the horizon. Chalcotrichite, an orange variety of cuprite, is abundant in some specimens. 72 Pounds of Sonora Sunrise! This huge piece of Sonora Sunrise weights about 72 pounds and measures approximately 30 x 30 x 25 centimeters in size. It is a collection-worthy specimen photographed wet by Rob Carroll of Dinomite Rocks and Gems. Click to enlarge. The first four names above are legitimate. 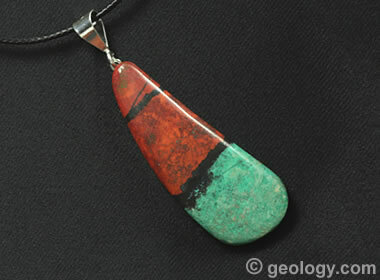 However, “Sonoran Sunset Jasper” or other names that include the word “jasper” are incorrect. The name “jasper” is to be used for materials composed of opaque chalcedony. Sonora Sunrise Locality: A map of northwestern Mexico showing the approximate location of the Milpillas Mine in the Mexican state of Sonora. 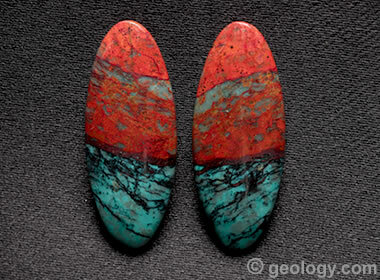 Sonora Sunrise Cabochons: A matched pair of Sonora Sunrise cabochons showing the red sky for which this material was named. These cabochons are approximately 32.5 millimeters high, 13 millimeters wide, and 3 millimeters thick. Material is from the Milpillas Mine, Sonora, Mexico. Sonora Sunrise is a rare material not seen in mass-production jewelry. Cabochons of the material are usually sold in the lapidary market. They are almost always freeform or uncalibrated pieces, cut to take advantage of colors and patterns present in the rough. Sonora Sunrise jewelry is usually produced by designers and other artists who custom-craft each piece of jewelry to accommodate the freeform and uncalibrated cabochons. Although Sonora Sunrise is a rare material, it is usually not extremely expensive because very few people know about it. It is generally bought on impulse rather than as a planned purchase. This type of relationship between a gem material and its buyers does not support high prices unless a company or an organization spends a lot of money to promote it widely. Sonora Sunrise presents a challenge to people who cut it into cabochons. Symmetrical cabochons in round or oval shapes can be difficult to cut because chrysocolla and cuprite are of different hardness. Iron minerals in the material can deposit onto the cutting edges of a diamond grinding wheel and require frequent maintenance. Most cabochons of Sonora Sunrise are at least a few centimeters in length because it is difficult to capture two materials in nice composition in smaller sizes. Block "Sonora Sunrise": A man-made imitation of Sonora Sunrise, made by mixing powdered cuprite and powdered chrysocolla with resins, then separately placing them in a mold to produce a pattern that might imitate Sonora Sunrise. This cabochon was offered for sale as "man-made Sonora Sunrise". Experienced people will recognize that it is an imitation without disclosure. Inexperienced people might need the disclosure to know that it is not natural. We have not heard of anyone producing synthetic (lab-created) Sonora Sunrise, but we have seen two types of imitation material in the market. This material appears to be made using a method similar to the manufacture of "block turquoise". Cuprite and chrysocolla (which might be small pieces or below-cutting-grade material) are ground separately into a powder then mixed with a resin that will harden. The resin mixtures are then added to a mold in small doses in an attempt to produce a color pattern of cuprite adjacent to chrysocolla that will imitate natural Sonora Sunrise. The mold is then placed under pressure to expel trapped air and bring the materials into intimate associations. The result is a block or slab-shaped piece of material that can be cut into cabochons or used to make other items. We have seen these items offered for sale as “man-made Sonora Sunrise”. The imitations should be easy for experienced people to identify because colors, color patterns, and mineral boundaries in the material have an unnatural appearance. Without disclosure some inexperienced people might not realize that they are man-made. 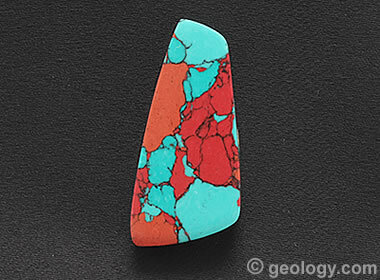 Composite "Sonora Sunrise": This cabochon is an assembled stone made by gluing slabs of cuprite and chrysocolla together and then cutting a stone that displays both materials. Composite stones of this type are easily identified by a "glue line" between the two materials. In this stone the glue line appears black under reflected light, but in transmitted light the thin glue line allows light to pass through. It was advertised for sale as "Natural Sonora Jasper". That is incorrect because it is not composed of jasper, and it is an imitation of either Sonora Sunrise or Sonora Jasper. The stone measures approximately 48 x 19 x 5.5 millimeters. We have seen composite cabochons that were probably produced by gluing a small slab of red cuprite to a small slab of green chrysocolla, then cutting cabochons that show portions of both materials. These imitations can usually be quickly identified because a straight boundary exists between the materials and can be seen with an unaided eye. Microscopic examination will reveal a distinct glue line. Some inexperienced people might be fooled by these imitations, which we saw advertised as “Natural Sonora Jasper”. Milpillas Mine, Cuitaca, Municipality de Santa Cruz, Sonora, Mexico: article on the mindat.org website, accessed March 2019. 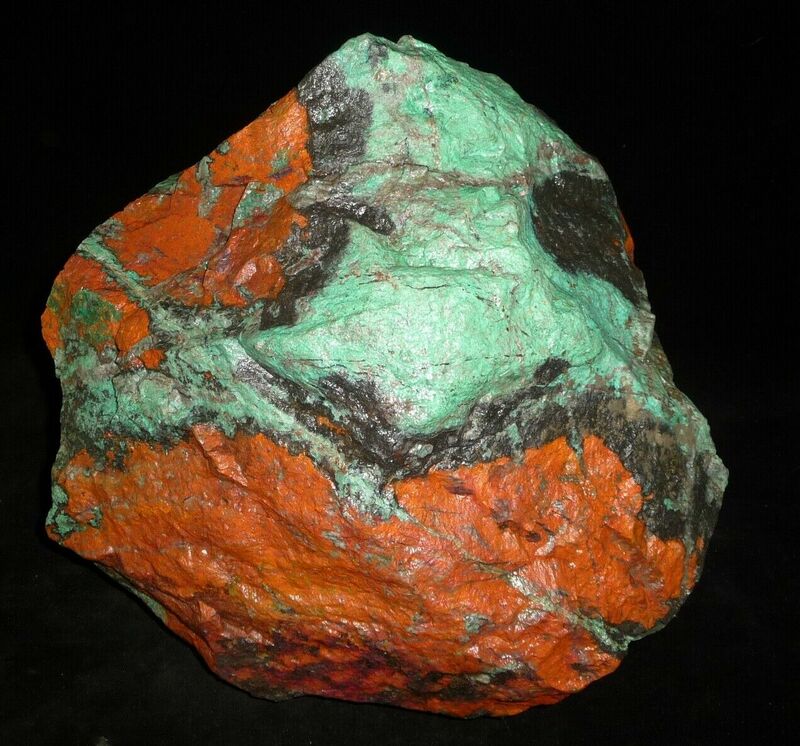 Extraordinary Copper Minerals from Milpillas, Mexico: article on the Treasure Mountain Mining website, accessed March 2019. Rocks: Galleries of igneous, sedimentary and metamorphic rock photos with descriptions. Minerals: Information about ore minerals, gem materials and rock-forming minerals. Volcanoes: Articles about volcanoes, volcanic hazards and eruptions past and present. Gemstones: Colorful images and articles about diamonds and colored stones. General Geology: Articles about geysers, maars, deltas, rifts, salt domes, water, and much more! Geology Store: Hammers, field bags, hand lenses, maps, books, hardness picks, gold pans. Earth Science Records: Highest mountain, deepest lake, biggest tsunami and more. Diamonds: Learn about the properties of diamond, its many uses, and diamond discoveries. © 2005-2019 Geology.com. All Rights Reserved. Images, code, and content on this website are property of Geology.com and are protected by copyright law. Geology.com does not grant permission for any use, republication, or redistribution.